The mural is projected to be finished soon, as Willette is still adding finishing details to it during her free time in Cav Block. “The project matches the task that's in the room. We want it to be interactive, so when Stacey did this project she asked Salamone what would be good for her to have,” said Hancock. Close your eyes and imagine a classic schoolroom. What comes to mind? Perhaps you see white brick walls and white tile floors; as far as decor, there might be some scattered posters with class expectations or maybe even a bulletin board displaying student projects. This sterile atmosphere is a reality for many classrooms here at HB. However, some lucky classrooms have had the privilege of getting a makeover by Interior Design students, taught by Candice Hancock, HB’s Family and Consumer Science teacher. 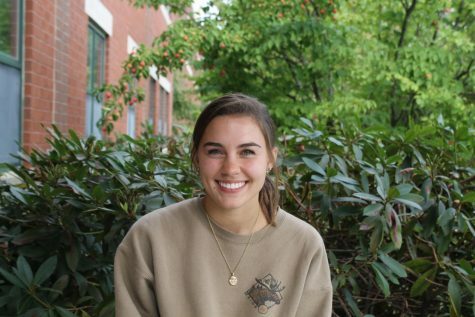 One of these Interior Design students, Stacey Willett ‘19, is taking on the project of adding some color to Marie Salamone’s English writing and literature classroom. 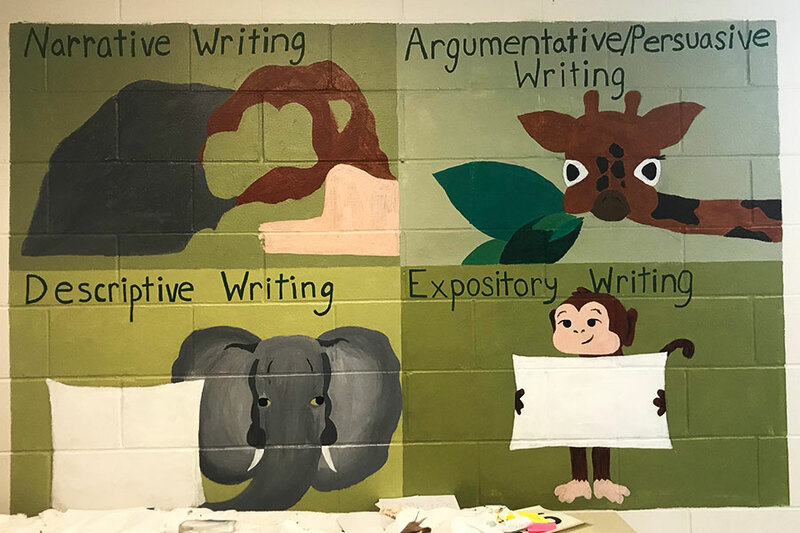 The mural Willett is painting is divided into four sections, each with different animals representing the four genres of writing: expository, persuasive, narrative, and descriptive. For Salamone, the mural is more than just a pleasant sight, but also an educational addition to her room. “I probably will [use the mural while teaching] when it’s finished. It’s good that [students] can see the genres since I teach a lot of writing courses,” said Salamone. Since early October, Willett has been collaborating with Salamone in creating a mural in her room. “Stacey was in my seventh-period writing [class] and she was looking at the other paintings around the room…so we came up with it and she designed everything herself,” said Salamone. For students who are interested in pursuing careers in the arts, the interior design project is a great experience for the future. “The goal [of this project] is how to work with a client, client satisfaction, real-world experience, and to have a portfolio because people want to hire you if you have experience and have something to show,” said Hancock. Willett, who will be attending Keene State this fall for her bachelors in Fine Arts, attests to the student benefit of the project. “To have a client, and to communicate with her, helped me work with someone else to create their vision,” said Willette. By collaborating with teachers, Interior Design students gain experience that they can apply in future jobs. However, if interior design students are not particularly interested in overseeing such a big project, students can choose to work on small in-class projects. “Every person has something different if they’re not up for it. Like storyboards instead of huge jobs because they really have to be ready [for future jobs],” said Hancock. As far as the future of classroom makeovers, interior design students will have this project option as long as teachers will allow. Salamone says she would recommend the project to other teachers. “I think that working with the students, with what they want to do and what you want in the classroom, is a good idea,” said Salamone.